Since Valentine’s Day is around the corner, today I’m going to share some insights about love from one of our favorite life philosophers, Charlie Brown and the Peanuts gang. My husband has loved them since he was a kid—he still has a Peanuts bed sheet from his childhood to prove his admiration. I’ve been paying more attention to their wisdom since they are dear to Gary’s heart and they’ve stood the test of time. 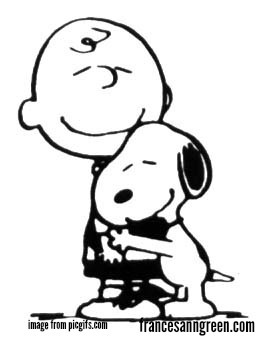 Charles Schulz expressed complicated matters in simple words and images, and he summarized much about love in his book, Love is Walking Hand-in-Hand. Here are 10 quotes about love from Charlie Brown and the gang and how we’ve seen them to be true in our relationship. Or fixing them a cup of coffee in the morning. Or filling up the tank of gas. Or dropping off lunch at the office. Love looks for ways to serve each other. Or it’s sending texts to each other. Or it’s an email sent from work to share some good news. Or it’s a phone call to see how the other’s day is going. Love finds ways to stay in touch with each other. When Gary and I were a young married couple, we watched my Grannie and Grandpa Disch hold hands into their frail old age. They held hands when they sat at the dinner table, when they strolled together and when they curled up in bed beside each other. As newlyweds we said we wanted to love each other enough to hold hands when we are as old as Grannie and Grandpa. We’re not old yet. But we’re still holding hands so we’ll be ready when old comes. Love keeps loving, and shows it. We’ve never made fudge together, but we do find things to do together. Friday night we made homemade pizza together and went dancing in Oplin-our new empty nest hobby. Last month we laid new floor together. Love is finding things you love to do together. It’s choosing to let some things go. It’s giving the other person freedom. It’s trusting the other to grow in their own time. Love respects the other enough to love them as they are and not nag them to become someone else. We’ve had some memorable walks in the rain. We both still laugh about a time in Costa Rica when we waited at a bus stop in the poring rain with water flowing over our ankles. We were soaked! Whether it’s a walk in the rain, a picnic, or a night at the theatre, love makes memories together. Our commitment is more than a note passed on the playground at recess. It’s a forever commitment. And commitment matters. It’s why we know we’ll be holding hands in our old age. It’s why we work through the hard stuff. It’s why we are intentional about making our marriage good. We’re in it for the long haul. Love commits. Fifteen years ago we started meeting for Thursday lunch. At the time our kids were little, and it was our chance to catch up without the home distractions. The kids are gone, but we both still look forward to Thursday lunch. You don’t have to meet at the pencil sharpener, or meet for lunch, but meet up somewhere. Love finds ways to connect. It’s sharing everything–shared adventures, shared space and shared bank accounts. It’s sharing the last of the milk, the last piece of chocolate and the last scoop of ice-cream. Love shares. And love looks forward to seeing each other again. There you have it–simple words about love from Charlie Brown and the gang. No wonder Gary likes them so much. I think I’ll go meet Gary at the pencil sharpener and go for a walk in the rain. May your relationships be full of popcorn sharing, fudge making, hand-in-hand love throughout the year! Do you have a favorite Charlie Brown quote that you would add to this list? Great words. Makes me want to break out in a Snoopy dance. Thanks, Dawn. I’m glad the prayers were helpful. May God keep working on all of us!